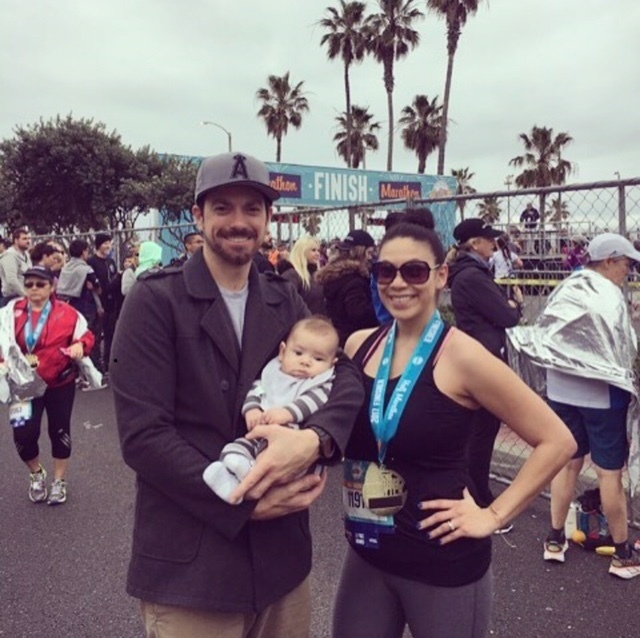 I decided early on in my pregnancy that I was going to run a half marathon after I had my son. I ran 3 other half marathons prior to my pregnancy, and running long distance was one of those things that I thoroughly enjoyed. I loved the sense of accomplishment and the constant mental and physical challenge you bring to yourself after every run. I figured, that if I continued to run and workout throughout my pregnancy, then there wouldn't be a problem when I ran after I had the baby. Well, I decided to stop running about 5 months into my pregnancy. I wasn't really into running on the treadmill while pregnant and, I guess, got a little lazy. So I rationalized not running for the remainder of my pregnancy. I did, however, continue to take work out classes up until 3 weeks prior to my due date. Once I had my check up, and my doctor gave me the ok to workout/run 6 weeks postpartum, I immediately hit the gym. I was set on getting ready for the half marathon! I will never forget running on that treadmill after I had the baby. I slowly finished one mile. My lungs were sore, my arms and legs were feeble, and I couldn't wait for it to end. I had never felt that out of shape. My body was weak and I knew I had my work cut out for me. 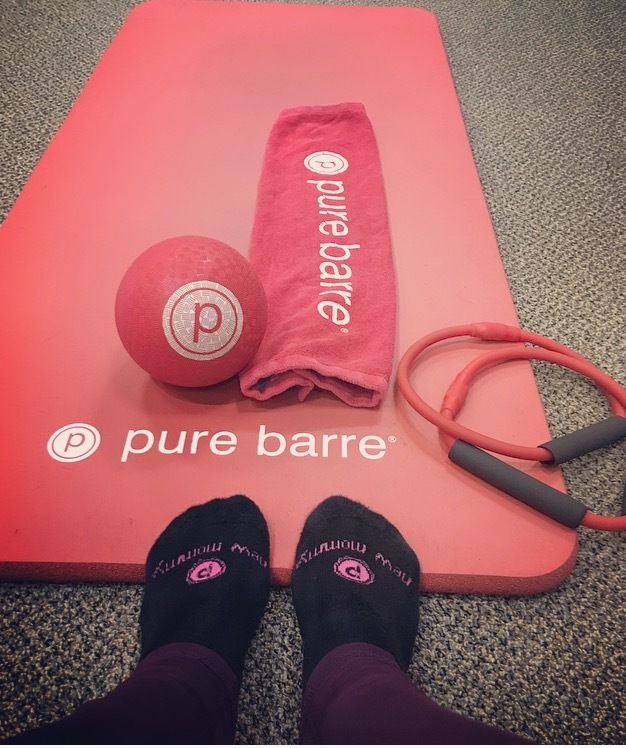 I started out steadily, taking my barre classes about twice a week, and running once or twice a week. I gradually started with 1 to 2 mile runs for a couple weeks. Then I would run 3 miles 3 times a week and run 6 miles once on the weekend. I mildly trained for about 5 weeks. Everyone was telling me how crazy I was for running the half marathon. I really didn't understand why people thought it was so crazy. I understand that training for a 13 mile run after having a baby isn't enticing to everyone. The thing that I don't understand, is why so many people limit themselves and instantly think a goal is unattainable. I'm not going to lie, there were moments where I doubted myself and thought, maybe I shouldn't run it. Or maybe I can just walk it, and take it easy this time. Then one day, I stumbled upon a women's blog, and she wrote about how she ran a half marathon after having her baby, and how empowering it was. My spirits were lifted, and I was even more determined to prove to myself that I could do it. The day of the race, I was so pumped and focused. My husband made me my traditional pre-race breakfast of a banana with peanut butter. Not to mention, I filled up the night before on some yummy pasta for my carbo load. It was perfect to sustain me throughout the race, as well as not fill me up. My hubby dropped me off and I was ready to go. I had my running playlist ready and my race day jitters were in full effect. It was go time and I started at a slow, safe pace for the first mile to feel it out. I gradually kept picking up the pace. Around mile 4, there's a bit of elevation. This is actually where I gained my speed, and I felt confident. I had this run in the bag. Mile 6 came and that confidence started to fade. The path starts to make its way down PCH and you're almost halfway done. Now, the best part of this race is the smell of the ocean and its constant breeze on your face. I used to live in Huntington Beach for 10 years, and this course will always be special to me, and my home course. Mile 8 is right around the time in the race where you start heading your way back down PCH, returning towards Main Street where you initially started. My energy level was depleting, and thoughts of just walking the rest of the race were flooding my mind. I drank water at one of the water stations for about 45 seconds, and saw all of the texts from my husband telling me to keep going. He was following me on an app on his phone, and he could track my pace the whole way. All I could imagine was him and my little, baby boy waiting for mommy at the finish line. I really just wanted to get to them as soon as possible. At that moment, I was running on pure adrenaline. My speed started to pick up, and my feet were starting to go numb. Mile 11 was approaching and it started to drizzle. I hear my name and I look over to my left. 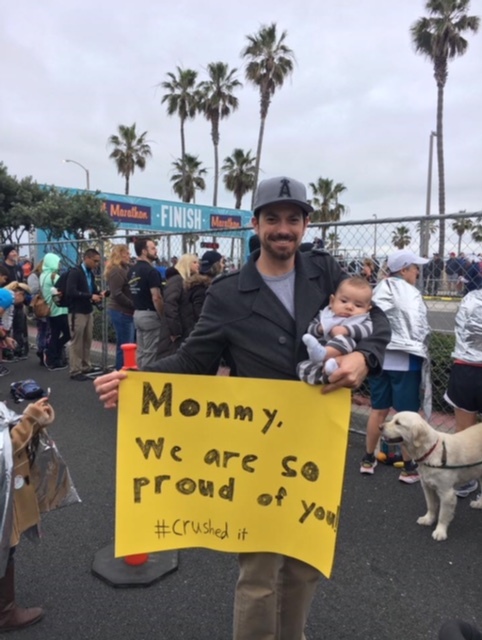 I see my hubby and newborn son cheering me on with a cute little sign and my heart exploded! I had one more mile to finish! I couldn't help, but to remember that first mile I ran after I had the baby and how weak I was, and how far I've come. I mean, I just finished 12 miles, what's 1 more right? The finish line was becoming closer and closer and I sped up one more time. I passed the finish line and had one of the most satisfying moments ever! I recommend having a feeling like that to everyone. Surf City half marathon is coming up in 2 more months and I plan on training much more intensely and annihilating my last race time. Stay tuned and see how I do!